to the Kentucky Horse Park in Lexington, Ky.
NASHVILLE, Tenn. (March 5, 2014) - Tickets are now on sale for the Ichthus Festival, the nation's longest-running music festival with a message of hope, peace and love. The 2014 event is returning after a one-year hiatus and will be held June 4-7 at the Kentucky Horse Park in Lexington, Ky. The Ichthus Festival, which started in 1970, was saved in May 2013 by Creation Festivals, which stepped in to revitalize the much-loved annual festival after financial problems caused it to close its doors. This has brought the Ichthus Festival into a larger family of festivals that also includes Creation Northeast, Creation Northwest and Sonshine Festival. All of these events share similar vision, passion and mission to impact our current generation with a life-changing message of faith, hope and love. To purchase tickets, visit showclix.com/event/IchthusFestival2014. "We are happy to announce the return of the Ichthus Festival to the world-renowned Kentucky Horse Park," says Dr. Harry Thomas, Jr., co-founder of Creation Festivals. "The Ichthus Festival has been a tradition in eastern Kentucky for more than 42 years, an event famous for college students, families, church groups and friends to experience the best in Christian music and speakers. The 2014 festival is certain to be 'An Epic Summer Experience!'" The four-day festival will be held in the campgrounds of the Kentucky Horse Park, and will hold true to the amazing sense of community that festival attendees have enjoyed in the past. The picturesque site for this year's festival features paved walkways, beautiful primitive camping close to the activities, plenty of premier RV sites available to those who rent for those who would like the added comfort for secure and safe access. Hot showers and the amenities of indoor plumbing will be accessible to all campers. There will be multiple stages that will showcase internationally-known bands and international speakers. Also coming back this year is the popular skate park (all skaters must bring their own helmet) and exhibit tent, the Deepend Stage, Fringe stage, and Dance parties. New this year will be a morning and late night Worship Stage, Electric DJ Stage, Country Stage, and Americana stage. In addition to the festival events, the Kentucky Horse Park features the world-famous International Museum of the Horse (an affiliate of the Smithsonian Institute), the American Saddlebred Museum, two restaurants, pools, basketball and volleyball courts and a children's playground. 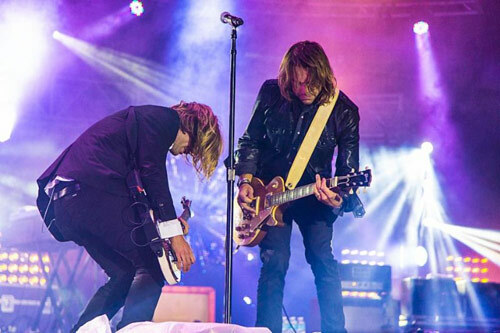 Ichthus 2014 will continue to play host to great bands like Needtobreathe, Switchfoot, Red, Mercy Me, Kari Jobe, Family Force 5, Jamie Grace, Colton Dixon, August Burns, Sleeping Giant, War of Ages, Green River Ordinance, Alex Hall, The Vespers and many more. Along witn great music and worship will be powerful teachers like Reggie Dabbs, Tony Nolan, Sean McDowell and Tony Campolo, who will bring a life-changing message of faith, hope and love. Bands and speakers for the 2014 event are being announced weekly at ichthusfestival.com and on Facebook at facebook.com/Ichthus. Dr. Bob Lyon, a professor at Asbury Theological Seminary in Wilmore, Ky., created the Ichthus Music Festival as an alternative to Woodstock, the 1969 rock festival held in upstate New York. The first Ichthus Music Festival took place at the Wilmore campgrounds in 1970. The festival typically averages more than 20,000 people in attendance. Through the years, scores of Christian music acts have performed at Ichthus, including Michael W. Smith, Petra, Casting Crowns, Andre Crouch, David Crowder Band, Family Force 5, Jars of Clay, Jeremy Camp, needtobreathe, Phil Keaggy, Red, Relient K, Skillet, Steven Curtis Chapman, Switchfoot and Tobymac. For more information about Ichthus Festival, visit ichthusfestival.com. Creation Festivals has a long history in the Christian festival industry. The Rev. Dr. Harry Thomas, Jr., and Timothy Landis founded Creation East in 1979 in Muddy Run Park in Lancaster, Pa. Since that time, the single festival has grown to two festivals on opposite sides of the U.S. (Creation Northwest was launched in 1998). "Generations have come to the Creation Festivals over the years with an expectancy to see God move," says Thomas. "The Creation family works tirelessly year-round to lay the foundation for people to get away from their normal routines and come to give 'A Tribute to Our Creator.' Nothing can compare to worshiping with tens of thousands of people, being a part of the candle-lighting service, or even watching young and old be baptized." Ichthus Festival is scheduled for June 4 to 7 in Lexington, Ky.; Creation Northeast is scheduled for June 25 to 28 in Mt. Union, Pa.; Sonshine Festival is scheduled for July 16 to 19 in Willmar, Minn.; and Creation 2014 Northwest is scheduled for July 30 to August 2 in Kennewick, Wash. To purchase tickets and for more information, visit creationfest.com.